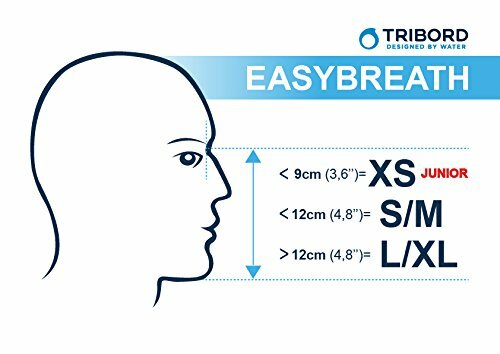 Introducing the Tribord Easy breath full face Snorkel Mask with the ability to allow visibility underwater where you will find your vision to be as clear as on a dry land. Your chances of getting to explore life in sea with easy access due to intensified accessibility will now become a reality with the Tribord Easy breath full face Snorkel Mask. This mask has made it’s way into our list of best full face snorkel masks. Find out for what reasons in the article that follows. The process of snorkeling is not appreciated by many who avoid undergoing the difficulty one might experience breathing through a tube while being submerged underwater. And we don’t blame them. People have this constant fear of their mouth coming in contact with germs making hygiene a main factor of avoidance. To further complicate things, having a snorkel in your mouth for extended periods of time is a surefire way to get a sore jaw. To put an end to problems like these, the Tribord Easy breath full face Snorkel Mask has been introduced to the market. 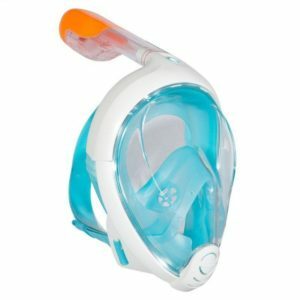 The mask offers easy inhalation and exhalation through the nose and mouth, allowing divers to make the most out of their underwater experiences. 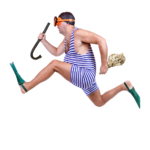 Are you wondering why you should ditch the snorkel mask that you already own and buy this one? What makes the Tribord Easy breath full face Snorkel Mask so different from the one you have? Well, the snorkel masks which are already available in the market end up with a foggy vision. Moreover, the regular snorkel masks do not provide a wide field of view of your immediate surroundings. Any form of leak may lead of water being accumulated in the mask. 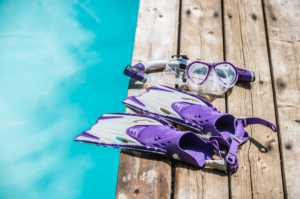 All of these issues have been resolved as the Tribord Easy breath full face Snorkel Mask comes with a guarantee of driving all of your underwater troublesaway. It comes with a huge size giving you a vast field of vision. A double-flow air system is attached to prevent instances of fogging up and thus hindering your underwater journey. 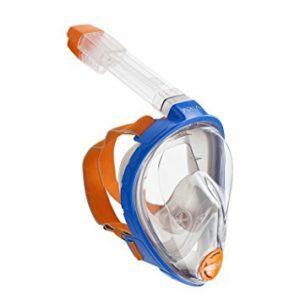 The top of the snorkel is immediately plugged the moment you dive into water to avoid water from flowing inside the mask, letting your face stay dry during the whole time. Do you have a kid who may be a confident swimmer yet is uncomfortable while snorkeling? Having to deal with a mouthpiece along with with additional accessories whilst swimming? Tribord to the rescue. As an added extra, Kids with braces or retainers will have nothing to worry about or distract them during their experience underwater. Even though it is mandatory for parents to give their children a few lessons and guidance, they will find themselves being apt at it in no time. You will find your children as little as 3 year old to be confident about getting in the water the moment you put a mask on them. 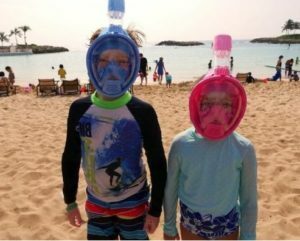 Since the mask comes with the availability of preventing water to get or distorted vision, your child will become easily accustomed to snorkeling. You do not want to end up with a mask that leaves marks on your skin because it’s too tight. A mask that’s too loose on the other hand will leave you unable to enjoy the underwater life because of the constant leaks and readjustments. Here is how you can get the perfect size of your mask online and get it delivered to your doorstep! The first step involves measuring the distance between the chin from the bottom and the bridge of the nose. Make sure that your mouth is closed during the process of measurement. If you find it to be less than 9-10cm, then you are going to pick the XS size. However, if it is measured as less than 12cm, then you will have to choose the small of medium sized mask. The measurements standing at 12cm or more will require you to purchase a medium or large size. Lastly, the size large or extra large is for measurement exceeding 13cms. If you have any trouble figuring out what’s your size, refer to the chart below. Even if you decide to pick one up from the store to avoid instances of product return, you can know which mask will work best on you. Try out more than one size at the store. If you find that the mask on your face is tight and you sense no form of space existing near the chin, then that means that that mask is the right pick! Customers were found to be skeptical about adding this item to their cart. However, those who took the bold step ending up liking the product stating how its performance exceeded the level of their expectations. All the powerful features of the Tribord Easy breath full face Snorkel Mask work for instance lack of fogginess or leakage. Even though the customers who read reviews stating the mask is hard to breathe in did not have a similar experience. One of the customers who have been using the Tribord Easy breath full face Snorkel Mask for over a year now has upgraded it to 4 stars. The fact that the mask perfectly handles leakages is why the customer chose to replace his old snorkel mask with the Tribord mask. “pretty thoughtful” product was the exact words used by him for describing the product. With the help of the Tribord Easy breath full face Snorkel Mask, you are in for an experience of seeing and breathing as easily as you can anywhere else! It does not matter if you’re a kid or even a beginner. The Tribord Easy breath full face Snorkel Mask is destined to work on all shapes and sizes. The quality of any product affects the quality of your day or experience. Local pharmacies do not carry the logo of delivering the best snorkel masks when the price tag is way too low and is affordable for everyone. Do not hesitate spending a little extra cash for you might end up regretting your decision.